Traditional seminary ethics courses tend to focus on an introduction to the main schools of ethical thought and approaches to moral reasoning, combined with discussion of a few contentious moral issues. Topics discussed often include abortion, euthanasia, capital punishment, sexual ethics, genetic engineering and war. While thought-provoking, these courses usually leave out the dilemmas people face every day at work. There is room to expand the study of ethics to include day-to-day decision making. The Theology of Work Project (TOW) has developed a number of valuable ethics resources. In this article, I want to introduce you to two of the most valuable tried and tested resources. Research suggests that most regular churchgoers only exhibit ethical understandings distinctive from the rest of the population as this relates to a few issues of sexual conduct, personal honesty and the accumulation of wealth. In most other respects, we are shaped more by the values of our culture than the ethics of Jesus. (Quote taken from “Will the Real Jesus Please Stand Up?” section of the Overview paper). The paper then goes on to examine and contrast ways ethical decisions are made in theory and in practice. In fact, the paper itself takes two forms – one a systematic presentation and the other as a case study. The assignment below uses the systematic presentation and encourages students to think about different ways that Christians have sought to use the Bible to establish and explain a Christian ethic for the marketplace. 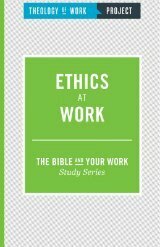 Read the Theology of Work article on Ethics and Work, specifically the systematic presentation option. explains which approaches you find most helpful and why. names those approaches that you don’t think are valid or useful and explains why. adds any other helpful approaches or perspectives that you think have been neglected in this discussion. describes how your understanding has been challenged, changed or reinforced by this exercise. A second helpful resource is the TOW paper, “Truth, Honesty and Deception in the Workplace.” Scott Rae, professor of Christian ethics and dean of the faculty at the Talbot School of Theology at Biola University, describes in a short video how he uses the TOW article on truth and deception in the courses he teaches. Rae teaches an undergraduate course on business ethics and a course in the MBA program on ethical decision making. In both of these classes he discusses truth-telling, disclosure and deception, and uses the paper as an indispensable resource for students who want to delve deeper. In Loving Monday, John Beckett compiles four decades of experience in the workplace to help us see the practical value of applying Christian values in our businesses and occupations. You will find timely wisdom and fresh ways to bring energy and meaning in what you do day in and day out.